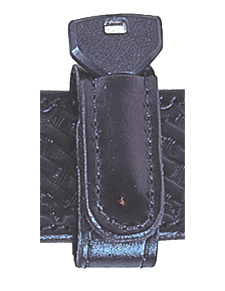 Combination Hand Cuff/Magazine Paddle holder, top-grain, heavy duty leather. Mounted on a contoured Kydex paddle with grip extenders to hold firmly during removal of cuff or magazine. Tension screw allows for several magazine sizes. Cuffs break trough snap for quick removal. Standard black snap, optional nickel and brass available. When ordering, be sure to be aware of right hand or left hand option.